This page is a translated version of the page Chilton and the translation is 100% complete. Chilton and Crocker are two of the most interesting between the many companies born in the golden age of American fountain pen that disappeared with the difficulties encountered in subsequent years. The first was created by the son of the founder of the second, that was absorbed in it. Past the golden age of the '20s Chilton, like most other producers of the time, suffered heavily the great depression of 1929. In the '30s sales deteriorated, and production continued to decline until the final exit from the market in 1941. Despite the high quality of its fountain pens, certainly not lower that of the far more famous Waterman, Sheaffer and Parker, Chilton never shone for in marketing capabilities: the spread of its pens never came out of the United States, and in the USA the distribution remained longtime localized in the North East of the country. Chilton pens were beautiful, functional and with great technical quality, but because of their low diffusion they did not had the success they deserved; therefore are quite rare and much sought by collectors. Around 1920 Seth Sears Crocker, founder of Crocker Pen Company left business and his son, Seth Chilton Crocker, took over the conduct of the company. In 1923 Seth Chilton Crocker entered directly in the fountain pen market founding in Boston a new company with its own name: the Chilton Pen Company. In 1925 he launched the first model of the new company. It was a ordinary flattop hard rubber pen, but it was using an ingenious pneumatic filling system evolved from the blow filler invented by his father. That mechanism was essentially a precursor of the touchdown filler that Sheaffer will introduce just over 20 years later. The pneumatic filling system used by Chilton is based on compression made by sliding the outside shaft of the pen over a internal metal cylinder which encloses the ink sac like a pump piston. The sliding barrel is equipped with a hole on the bottom that must be hold closed with a finger in the process of pushing it down for compression, but once opened it allow the expansion of the ink sac and the subsequent filling. The mechanism was simple, functional and robust, and allowed Chilton pens to use ink sacs with significantly larger dimensions than those of competitors, so that the pens were promoted with the slogan Twice the ink. However the shape of pens was not proportionate because to block on the sliding barrel the cap had to be extended over the full length of the nib section, and that should be quite long because it was used to hold the pen when filling it. So the pens were having quite an excessive cap length. 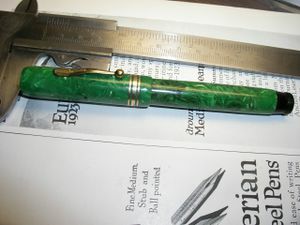 The first Chilton pens were made in black or mottled hard rubber, but as early as 1926 new models built in celluloid were produced, using the classic Jade green and Pearl Black colors. In these early years all Chilton production came from the Boston plant, and the models of this period are often referred to by the name of this city. In the late '20s (the exact moment of the transfer is not clear, some suggest it in 1926, others in 1929) the Chilton moved the production facilities from Boston to Long Island (in New York) also incorporating the remains of Crocker. In this period new celluloid models with new colors were produced, and a second version of the filling system was developed. In the new mechanism the external barrel was no longer used directly to do the compression, and there was an internal sliding metallic cylinder that could be driven through an handle back. The working principle was the same, but in this way the size of the cap could go back to a more proportionate dimension. In the early 30's also Chilton started to produce streamlined models, following the trend introduced by the Balance. The this period models, produced in 15 color variations and 8 different sizes are commonly called Long Island. More or less at this time there was the birth of the so-called Lox-Top models, equipped with a particular mechanism (called Lox-Top) that prevented the cap from unscrewing when the pen was inserted into a pocket, this was carried out by a small pin, actuated by the clip, which was to hang on the section when the clip was moved from the cloth of the pocket. Between 1934 and 1935 (the two dates comes from different sources, but we use the second one, mentioned in a 1937 catalog) Chilton introduced what is probably his masterpiece, the Wing-flow model. The name come from the peculiar pen nib, cover by a patent (nº US-2089449) that was filed in 1935, equipped with lateral wings folded around the feeder, so that the nib could not be misaligned. In 1939 Chilton produced his last quality pen, the Golden Quill. The pen was launched at the New York World Fair. The new pen had a simple and austere style, in sharp contrast with the opulence of the Wing-flow. The quality was as always impeccable, but the company had economical difficulties and the new pen was not publicized enough: sales were scarce so that the pen is very rare and today is very sought by collectors. In 1941, after having produced some low quality economic pens (the Chiltonian, sold mainly by correspondence), Chilton, unable to generate sufficient sales, closed its doors and ceased operations. ↑ that year is esplicitely mentioned in a 1937 catalog for the Wing-flow model. This page was last edited on 16 December 2018, at 19:46.